Crossing our fingers for a successful go at it. Such an extablished working commuter [regional] service would fill a niche. So has the Surin flight started? The airline's web site seems broken, online booking is not working. Maybe this isn't really happening. Not surprised towards these events. does anyone know if any airline flies to ubon from suvarnabhumi mid morning? Visited Buriram airport today and obtained latest Nok Air schedule. No sign of any other operators. 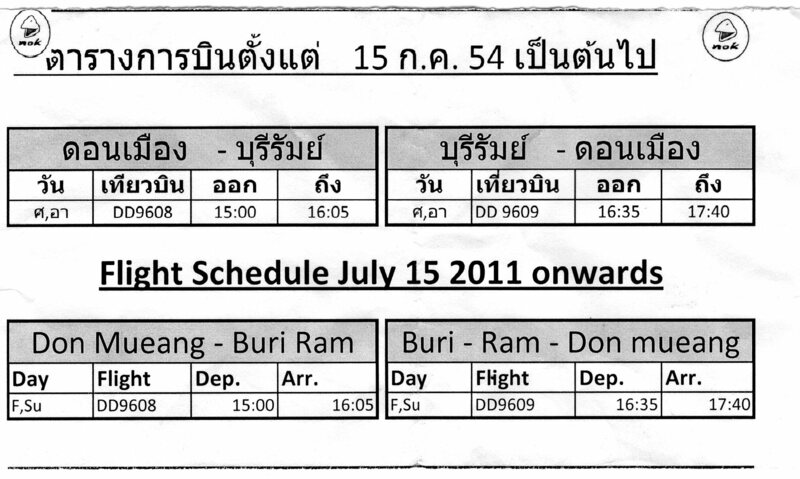 Does anybody know what the latest flight schedule is for Bkk > Buriram with Nok Air ? That is if there actually still is one ? TBWG Do you know if the timetable is still ongoing ? NOK doesn't fly there anymore, and HAPPY and SOLAR don't do either. any flights to buriram at the moment ? Who is flying from Roi Et now? has airport closed, Thanks for any info. AirAsia is flying to and from Roi Et Airport. I put my 3 boys recently on a flight to Bangkok. It has been reported that beginning 1 October 2012 Air Asia flights to and from Ubon will be from Don Muang instead of Suvarnabhumi. No reason given. So will not have convenient connections with international flights or with city line. I am simply amazed at the amount of disinformation on this thread. Look here, just read the papers, listen to the news, talk to your local travel agent or go to the desk at your nearest airport to get flight information. Here is an example of not reading the news. Air Asia has given its reason very clearly, many times, for moving to Don Muang. This is because AOT will give huge discounts to any airline that moves or has already moved (eg Nok Air) back to Don Muang. These discounts are an offer not to be refused. Hence, most of the budget airlines and charter flight will move to Don Muang. THAI, will probably stick to Suvarnabhumi for the time being. For local business in BKK I prefer Don Muang. But for international connections then of course Suvarnabhumi is more convenient. However, the taxi ride between airports always takes about 40 minutes for about 250 baht.